We help people sleep better at night. As a Financial Representative for Northwestern Mutual, Joel Seleskie provides expert guidance and innovative solutions for his clients' personal and business needs. He doesn't do it alone. Together, we stand committed to providing the best customer service possible. If you have a problem or need assistance at any time, please let us know. Chuck joined the Seleskie Financial team in 2017. He is a graduate of Miami University with a degree in Finance. Chuck holds the Chartered Financial Analyst® charter, and is a CERTIFIED FINANCIAL PLANNERTM practitioner. Chuck resides in St. Paul. He enjoys golfing, skiing and cooking. Sarah has been a member of the Seleskie Financial team since 2015. She graduated from The College of St. Catherine. Sarah resides in St. Paul with her husband Corey and their son Owen. She enjoys reading, cooking, being outside and spending time with family and friends. Jake has been with Northwestern Mutual since 2015 and joined the Seleskie Financial team in 2017. He is a graduate of the University of Wisconsin-River Falls with a degree in Finance. Jake currently resides in St. Paul and enjoys spending his free time playing basketball with his two younger brothers. Rachel joined the Seleskie Financial team in 2017. Before joining Joel's team, she spent 11 years working in the Property & Casualty Insurance industry. Rachel resides in Lino Lakes with her husband Brian, son Owen and daughter Harper. While chasing around the two littles, Rachel enjoys taking advantage of the Minnesota Summers with as much time outdoors as possible, throwing together impromptu BBQ's with the neighbors and relaxing by the bonfire with her husband. Bethany has been with Northwestern Mutual since 2004 and joined Joel's team in 2013. She works closely with Joel on investment operations. She holds her securities and insurance licenses. Operational requests such as placing trades, providing account values, processing check requests, IRA distributions, wire transfers, and gain/loss information. Bethany graduated from Gustavus Adolphus College with a degree in financial economics. Bethany enjoys running, traveling and spending time with friends and family. Jill has been with Northwestern Mutual since 2012 and joined Joel's team in 2016. She works primarily in operations and client service. Operational requests such as providing account values, check requests, IRA distributions, account transfers and client service. Jill is a graduate of the University of Wisconsin-Oshkosh and has over 20 years of industry experience. She resides in Hudson, WI with her husband and son. She enjoys spending time with her family and is usually in the middle of a home improvement project! After being a longtime client of Seleskie Financial, John joined the team in 2016. 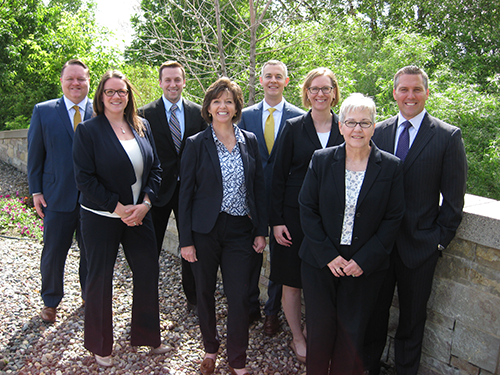 Prior to joining Joel's team, he was a partner at one of the Twin Cities' top law firms. His law practice focused mainly on representing financial institutions. John joined Seleskie Financial to help clients focus on and achieve their investment goals and protect their family's finances. Originally from Sioux Falls, SD, John moved to Minnesota to attend the University of Minnesota where he completed his undergraduate degree with a double major in Accounting and Management. He then attended the University of Minnesota School of Law and attained his Juris Doctorate. John enjoys trying to keep his wife Cynthia happy (with occasional success) and keeping up with his two daughters. Roberta has been an integral part of Joel's team with Northwestern Mutual since 2002. She is responsible for assisting clients with all of their individual needs. Before joining Northwestern Mutual, she spent 26 years working for 3M and Imation. Roberta resides in Hastings with her husband Scott. She enjoys spending time with her 5 grandchildren.